[INQ. NO. 1510M38] Innovent is a specialized company developing smart IT solutions. Under the business motto of “Innovation and Invention”, Innovent develops and produces various smart IT solutions by utilizing the accumulated technologies (such as multimedia processing technologies, wired and wireless communications, highdefinition video processing technology, embedded IT convergence technology, home networking control technology, system and component technologies) and the differentiated ideas from those of competitors. 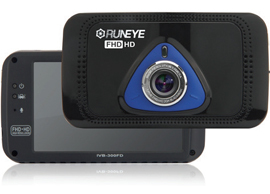 Innovent’s Runeye Classic (IVB-300FD) is a high-quality two-channel vehicle black box using full-HD Sony 2M pixel of image sensor and a four-inch full-touch 800×480 WVGA of IPS LCD screen. It shows the recorded image both from front and rear cameras on the LCD screen in the real time basis at the same time. For video resolution, the front camera has a 1920×1080 of full-HD and the rear camera features 1280x720HD. The perfect GUI control is fully possible with the four-inch full-touch screen on LCD. The recorded video can be displayed very easily with simple GUI control with the full-touch LCD screen as well as full control of the IVB- 300FD. The company aims to grow into a powerful venture company that can share the products created by a series of market-leading business activities.